There are a number of tools traders use to get information about order flow, liquidity, and/or volume to trade the market. Some traders like to use Footprint charts, while other use Volume Profile or simply rely on the DOM to give them information about market conditions. Still others use Bookmap. Given these different options, it’s important to understand what the differences are between them. 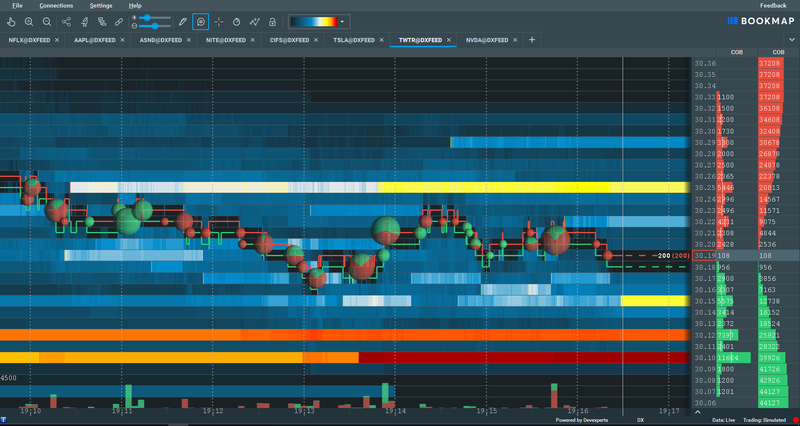 This article will first cover how traders use the DOM, Footprint (FP) charts, and Volume Profile (VP) charts to understand market liquidity and volume. It will also explain how Bookmap shows this information and why it gives traders an advantage over other types of charts. If a trader wants to know what price levels limit orders are located at, the simplest way to get this information is to use the Depth of Market (DOM). Most trading platforms offer the DOM as part of the default configuration. In a DOM, the left column (blue) shows the number of contracts that make up limit buy orders at each price level. In the column on the right (red) is the opposite data: the number of contracts that make up limit sell orders at each price level. A horizontal bar separates the current price from those above or below it. The DOM only shows limit orders, not stops. If a trader is skilled enough at using a DOM, he may be able to spot imbalances in the market that could affect price. For example, if a particular price level has an unusually large number of contracts on the bid, this level may provide support for the price. This may be a good place to enter a long trade or place a stop on a long trade. On the other hand, if price goes through this level, it may indicate that a large number of market sell orders are being issued. This could be an opportunity to go short. The advantage of using a DOM is that it gives traders access to information about market liquidity. This information is not available in candlestick or bar charts. But also, it has two main disadvantages. First, a DOM only provides information about liquidity in the present. It doesn’t offer any insight into what happened in the past and what could have caused market liquidity to be in its current state. For example, let’s say the DOM shows 371 contracts for ES futures offered at $2789.50. But let’s say 300 of these contracts are offered by the same big institution. If this institution cancels its order, the DOM will change to show 71 contracts for sale at that price. Unless the trader was watching that particular price at the moment the order was canceled, he will be unaware that a large order was just cancelled. But this cancelled order may have a strong impact on the market, since it may cause high-frequency trading algorithms to behave differently than they would have otherwise (they may start buying, for example). This information blindspot is a big limitation to using the DOM. Second, aside from the volume of the most recent transaction, the DOM shows no further information about market orders. It doesn’t show the volume of market orders over time the way a volume indicator does. This can make it difficult to know why a particular level of price was breached. 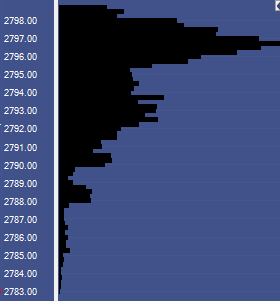 For example, let’s say there are 140 limit sell orders for ES at $2788.25. And let’s say the price jumps to $2788.50. A trader may be left wondering what happened. Did the sellers cancel their orders? Or did more than 140 contracts worth of market buy orders transact? Despite these disadvantages, the DOM is a valuable tool when compared to only using a price chart. But there are still more advanced tools to understand market liquidity. Because the DOM gives no information about historical market orders, many traders have turned to using Footprint (FP) charts. Footprint charts print a “candle” similar to a candlestick chart. But instead of showing the open, close, high, and low price for a particular time-period, these candles show the volume of market buyers and sellers at each level within that interval. At each price level, there are two numbers separated by a vertical line. The number to the left of the vertical line is the number of market sell orders that hit the bid at that particular price. The number to the right of the vertical line is the number of market buy orders that hit the ask at that particular price. In order to detect market imbalances, an FP chart compares the number to the left at a particular level with the number to the right one level below it (the reason for comparing two different levels is to account for the spread). If the number on the left is much greater than the number on the right one level below, it means there is a large number of market sell orders being issued compared to market buys. This indicates aggressive selling. If the opposite is the case and the number on the right at a particular level is much greater than the number on the left one level above, it means there is a large number of market buy orders being issued. This indicates aggressive buying. If a trader is skilled at using an FP chart, he may be able to spot market imbalances as they are forming. For example, let’s say that the price is rising. An FP chart may indicate aggressive buying. Let’s say that the price then stalls out and the FP chart shows aggressive selling. This may mean that a reversal is occurring. The benefit of using an FP chart is that it gives information about the volume of market orders. This is information that is not available in either the DOM or price charts. However, there are also significant disadvantages to using an FP chart. And these should be taken into consideration by traders. First, FP charts show information about volume, but not liquidity. So if many more traders are hitting the “market sell” button than the “market buy” button, an FP chart will provide this information. But this doesn’t necessarily mean there is a market imbalance. It may be that sellers are selling into a huge pool of limit buy orders. 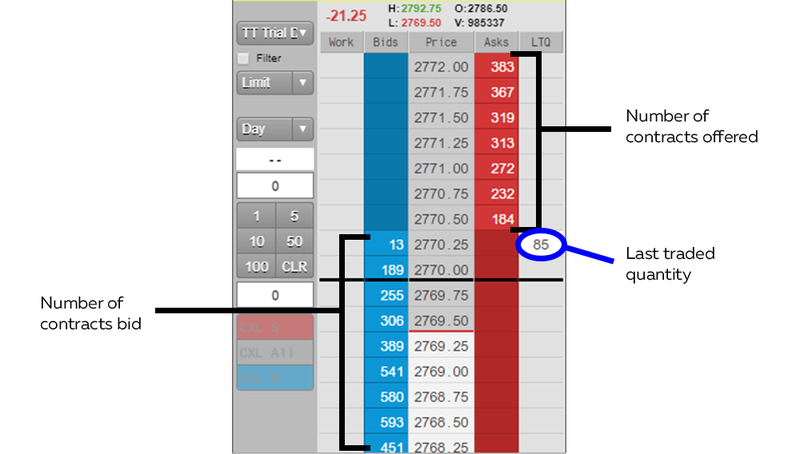 If so, these limit orders will be invisible to a trader using a footprint chart. Second, because FP charts do not show liquidity, they suffer from many of the same problems the DOM does. They do not show if a big institution or a large number of traders has cancelled limit orders. Without this information, traders may fail to understand why the price is behaving the way it is. Like the DOM, FP charts can be a useful tool in some contexts. Still, there are better ways to understand the market. Another popular way to understand the flow of orders is through a Volume Profile (VP) chart. A VP chart is a histogram that shows the number of market orders at each price level during a period of time set by the user. This allows the trader to see which price levels attract the greatest amount of market orders. The price level that has the highest volume is called the Point of Control. VP traders believe the price tends to return to this this point of control, or at least to stay near it. Like the DOM and FP charts, VP charts may be useful in some circumstances. They may allow traders to notice when a particular price is attracting buyers and sellers. However, VP charts also have disadvantages similar to the other types of charts mentioned. Like FP charts, VP charts only show information about volume. They give no information about liquidity. For this reason, it is possible for volume profile charts to give misleading information. For example, there may be a large number of transactions occurring at a particular price simply because there is a large number of limit orders at that level. If these orders are cancelled, volume may not occur at that level again. Like the other chart types on this list, Volume Profile can sometimes be an effective tool. But there is a more effective way to display market information. With Bookmap, traders get the advantages of the DOM, FP charts, and VP charts, but without the disadvantages. Sounds good, right? Here is how Bookmap displays information about market liquidity and volume. In order for any transaction to take place, there must be liquidity. Without limit orders, there are no traders to take the other side of market orders. 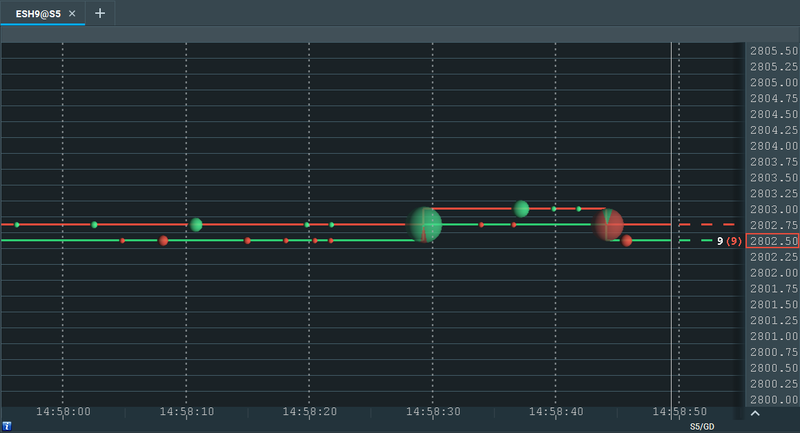 So the first thing we need to display in a chart is the best bid and ask over time. The red line on this chart is the “best ask,” the lowest price at which a sell limit order has been placed at that moment. The green line is the “best bid,” the highest price at which a buy limit order has been placed. The space between these two lines is the spread. If a trader places a market buy order, he must pay the price at the red line. If a trader places a market sell order, he must accept the price at the green line. The “current price” is the price at which the most recent transaction took place. It is represented by a green or red rectangle. In the image above, the latest transaction was a market sell order of 4 contracts at $2802.25. Like all market sell orders, this transaction occurred at the best bid. Once we know what the best bid and ask are, the next step is to determine the volume of market orders. Here is how Bookmap displays that information. Each bubble on this chart is the amount of traded volume at that time. The larger the bubble, the more volume traded. The smaller the bubble, the less volume traded. If a bubble is completely green, there were only market buy orders. If a bubble is completely red, there were only market sell orders. A bubble that is partially green and partially red implies a mix of market buy and market sell orders. As with an FP chart, these volume bubbles allow a trader to see at a glance whether there is an imbalance of market buy vs. market sell orders. As with a VP chart, these volume bubbles also allow a trader to see which price level attracts the most volume. While the best bid and ask provide some information about liquidity, we still need to know how many orders are placed at levels other than the ones closest to the price. In most trading platforms, this information is provided by the DOM. But as we said earlier, the DOM doesn’t provide historical information. Bookmap solves this problem by providing a heatmap, which adds another dimension to the chart by recording DOM information and displaying it on the chart over time. These bars of color represent limit orders. A red bar represents the largest number of limit orders. Orange is the second largest. When liquidity declines, the colors shift from red to orange, yellow, white, light-blue, dark-blue, and finally, to black. 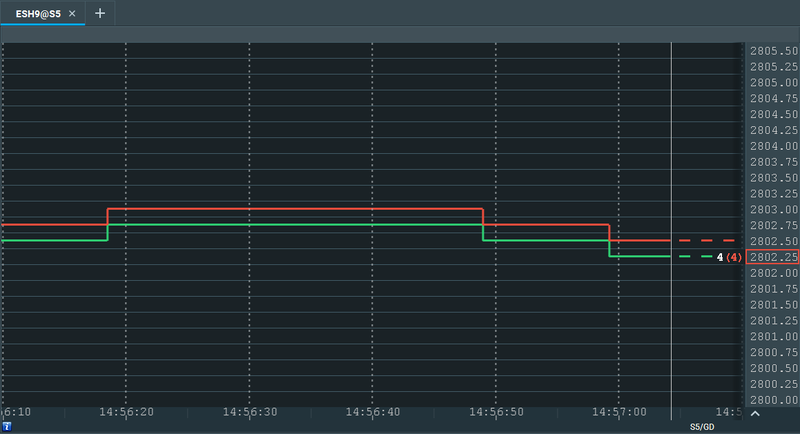 If limit orders are placed and then subsequently canceled, the heatmap will show this information by displaying a colored bar on the left side of the screen that fades as it approaches the right side. Using Bookmap, traders can discover information about the market at a glance, in a way that is much easier to comprehend when compared to using other types of charts. For example, if a trader sees the price moving upwards towards a large band of liquidity, he can expect the price to encounter resistance when it gets there. If large volume bubbles appear when the price gets there, he can watch to see if the line of liquidity disappears. If it does, this means market orders have cleared away the limit orders sitting at that level. This may mean that the price is about to move higher. On the other hand, if the line of liquidity stays in place and the price falls, this means there were not enough market orders to test or trade through that area. This implies price may retrace back to an area of higher interest with more transaction, such as the Point of Control. For another example, if a trader sees that there are large, green bubbles at one particular price level, but these bubbles shrink or disappear entirely as the price rises to a new level, this implies buyer exhaustion at the new level. This is less bullish for the price and may indicate a potential reversal. There are many other examples of how Bookmap can be used to understand the price and make profitable trades. For more information, check out our complete 4-part course on how to trade using Bookmap. To succeed in trading, understanding liquidity and volume is key. 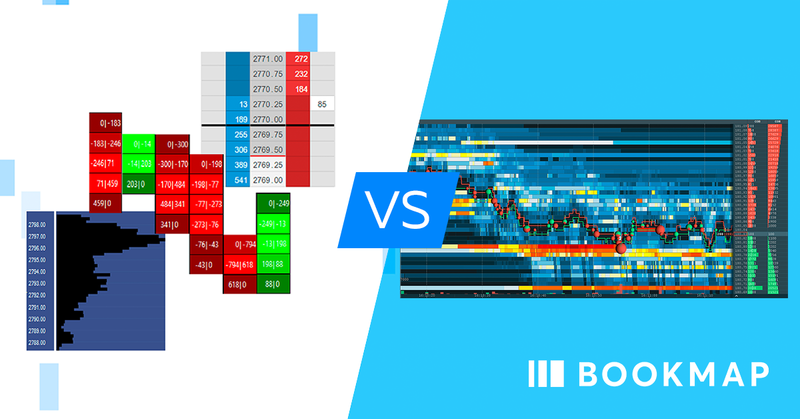 We hope you got some insights with this explanation of how the DOM, Footprint charts, and Market Profile charts each attempt to accomplish this aim – and how Bookmap combines the advantages of each of them without their disadvantages. Ready to get started with Bookmap? We offer a free version with real-time data from crypto markets and delayed data for stocks – quite enough for you to test what we have covered above. If you find that you are serious about using Bookmap for futures or stocks, you can trade with it in real-time for as little as $39/month. Browse all of Bookmap packages here. Or, if you would simply like more information on how to trade using order flow analysis, keep an eye on this blog. We love providing educational information to traders, and we frequently provide new posts with tips and techniques for trading successfully.